Got your hands on millions worth of data, but can’t find ways to monetize it? You aren’t alone! There are thousands of businesses experiencing the same issue. With the advancement in technology, and better IoT and machine learning models, modern businesses are bound to deal with big ounces of data that require a lot of curating before it can be put any good use. Knowledge was power, today data is power! With this powerful weapon, you definitely require guidance on how to curate this data and make it relevant. We first built the cloud, then data visualizations and business dashboards crashed their way in, thus replacing spreadsheets for analyzing and observing data insights. But now, data analytics isn’t just for the sake of analyzing, it is much more. Business Intelligence is also finding its way to enterprises. It has been a focus light throughout 2018, and now it’s time to continue its reign in 2019 too. Businesses, whether small or large are now looking for expanding their business intelligence and seeking solutions from the huge canopy of BI. Today, every businessman’s focus is on how to manage their increasing data this year. 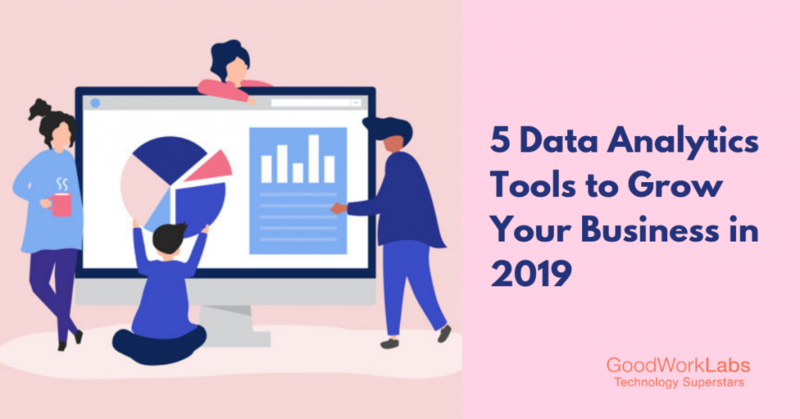 So, here are the top 5 data analytics tools to help you drive business growth in 2019! AI is helping machines to synthesize the functioning of a human brain. We need to know how our business is performing every day and every week. But with the help of artificial intelligence, we can understand the live performance of our firm. It means, we can see the insights every second! Sisense is a great tool for building an intelligent AI system. The AI algorithm is supported by high-performing neural networks and is completely accurate. A lot of tech giants are using AI in many ways to keep themselves in the forefront. So, in 2019 it’s no surprise that this trend will keep growing. It is highly customizable and it transforms your complete data into dashboards and elastic tubes. You will come across a lot of statistical tools and features in this tool. You can create customizable dashboards for each team member in your company. By maintaining and managing your data levels properly, the companies get leverage to compete in the global market and uphold their business intelligence principles. To know how your business is doing online, you will have to trust web analytics tools such as Google analytics. But to give a tough competition to the Google Analytics itself, you have the Click tale that also provides an in-depth analysis of your website. This is becoming very popular amongst the businesses and website owners due to its amazing features. The Click tale tool also makes it easy for assisting business. This tool also offers you insights on behavioral analysis along with web analytics. It offers data optimized tools so that you can improve the inward flow of business. You can also check the path analytics of your website with this tool. With this platform, you can reach the required goals and formulate a good customer acquisition strategy. SEMRush is the right data analytics tool for examining your marketing strategies. They offer features which help you track KPIs and also the analysis of how your content or business is doing online. Also, this tool helps you analyze according to the search engine visibility of your website. SEMRush is a one-stop shop for all your SEO and Digital Marketing Analytics. It also gives insights on keyword performance, backlinking data and other website analytics. With SEMRush, you can also review and track the performance of your competitor’s website and use that information to bid for keywords to improve your digital marketing efforts. Data Melt helps in power analytics. It comes to your rescue when there is a need for intense analysis. Also, if you are thinking this comes with a set of tools, then you are mistaken. You can customize it according to your will. Also, you can use it for decoding fields like mathematics, financial marketing, engineering, and statistics. Also, it has a great number of tools and is available over 500 Python modules. DMelt or Data Melt is in various languages. This tool can also be applied for any kind of business analysis. Kissmetrics is used especially for understanding the whole route of customer’s behavior. For a business to grow, there is a need for understanding what the customer wants. By studying his/her searches or predicting what he/she usually looks for, we need to strategize in a way that our product is reaching them and striking a right chord with them. Also, Kissmetrics will be of huge help if you are making any digital marketing strategies. The tool, which was founded by the famous SEO strategist and Guru Neil Patel, offers an exclusive and holistic marketing analytics solutions for all business challenges. This tool also helps in engaging more customers. The Kissmetrics tool easily integrates with your already existing analytics tools and also provides constructive criticism on the insights you drive. Also, you can execute smooth digital marketing initiatives with the help of its customer behavior- based automation features. With these tools in hand, you can now do social media marketing in the right way. Thus, with such data analytics, it can help restructure your marketing approach and also attract more paying and prospective customers. There are many factors for a business to flourish. You have to cater to your customers, their expectations, and in a similar way, you have to look at growing your sales funnel too. If you are turning towards being a more data-driven organization, then understanding the data triggers of your business is crucial. Deploying or using any of the above tools will really put your company in high fame, or if you are looking for a custom-made data analytics tool for your business, then drop us a quick message here.